On Monday, the 25th of June, 2012, the American Party of Labor successfully concluded its Third Party Congress. The “Congress of the Flags,” as the Third Party Congress has been named, was held in Chicago, Illinois between 22 and 25 June. At the Congress, the Party further perfected its internal and external organization. The Party Platform and Program were fine-tuned to fully articulate the Party’s political and ideological stance. The many issues discussed and decided upon, ranging the gamut from domestic economic and political concerns, such as the defense of workers’ rights and the ongoing struggle for racial and gender equality, to the international scene, such as organizing and fighting against U.S. imperialism and its aggressive war agenda, will serve to sharpen the Party as the American working class’ weapon in the battle for peace, democracy and socialism. Concluding ceremonies for “The Congress of the Flags” were held at the Haymarket Memorial in suburban Chicago. 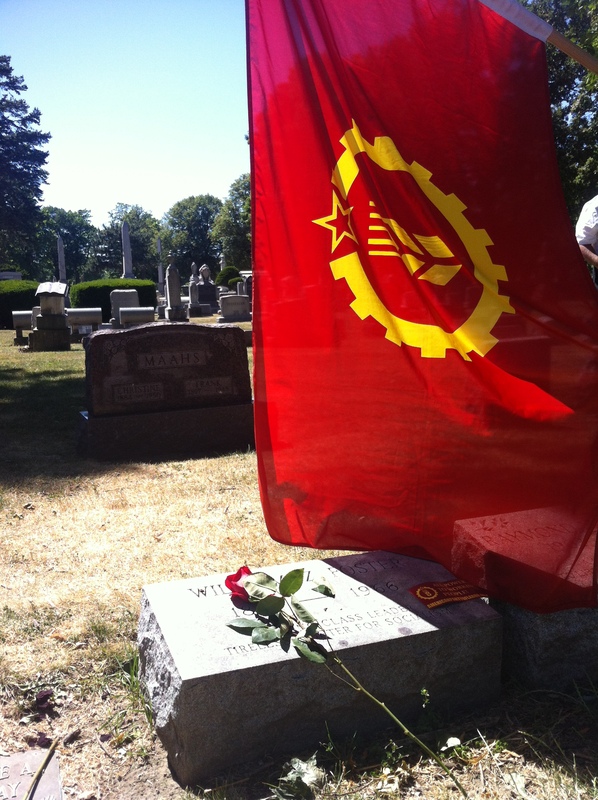 Comrades of the APL, carrying red flags with images of the Party’s grain & gear symbol, laid flowers at the monument to the Haymarket Martyrs and before the graves of such heroes/heroines of the American people as William Z. Foster and Elizabeth Gurley Flynn. On behalf of the Central Committee of the American Party of Labor, allow me to welcome you to this, the closing ceremonies of our Third Party Congress. Today we stand amidst the ashes and the remains of our heroes and martyrs. Let us take this occasion to reflect, reflect both as individuals, as men and women, on the struggles, the aspirations and the dreams that brought us to this place and time. Let us also reflect on the history that lies all around us etched in stone and let us never forget the names of our antecedents. The names, of Tom Paine, of Daniel Shays, of Osceola, of Pontiac, of Tecumseh, of Crazy Horse, of Frederick Douglass, of Nat Turner, of the Mollies, of the Wobblies, of John Reed and Bill Foster, and of the rebel girl Elizabeth Gurley Flynn. Let us never forget the reason why we are here, and let us never forget that we are a part of that tradition and part of that history. And let us swear, upon these sacred bones, that we will forever remain united until we have made their dreams, and ours, reality! Our comrade previously spoke of the past. Today, we must think of the future! We have gone, in the short space that this Party has been in existence, from a small collection of Marxists who desired a Party who was not subject to revisionism, to a united party of the working class of the United States. We dedicated ourselves in 2008 to be the leaders of change and the agents of revolution that we dreamed we had. We became the leaders that we wanted, the leaders that we needed. That said, our work is not complete. The work of the Third Congress has further perfected our organization. It is therefore that I pledge, and all of my comrades, I hope, pledge as well, on these sacred bones, these martyrs, to do our duty, not only to our ideology, not only to ourselves and not only to our country, but to the working class and to the world as a whole. Therefore, comrades, we must work forward. Not only to perfect our ideology and ourselves, and our organization, but we must also work to perfect, within this country not just a political revolution, the one everyone thinks of, but also a revolution of consciousness. The working class understands that they are oppressed. They may not understand how to express that. We must change that, and we must show them that there is a way the world can be different, that they are the ones who can be in control and are not currently. We must have a socialist revolution. The state operates on the basis of the class nature of capitalism, and it will continue to do so until it is replaced by proletarian democracy. Once workers have have joined the struggle, either as members or as supporters, we must work, after the revolution, to construct a new society based on liberté, égalité, fraternité. Thank you. I’m glad to be with you today. This is an occasion for reflection on the struggle that has preceded us, on the struggle that lies ahead. We are here with our comrades. With our comrades who are alive to fight today, to fight tomorrow, to fight until the battle is won, and we are here with our comrades no longer living, who have given everything for the cause of revolution. Our cause is nothing new. Our cause of generations of the oppressed to the first instances of social oppression. Ours is a struggle that began when the first slaves resisted the first slave owners. And we are here today to remember those who have allowed us to stand on their shoulders, to help, with the benefit of their example, and with the benefit of their concrete achievements to move ever forward. Today I am proud to be here, with the American Party of Labor, which is the most revolutionary organization in the United States of America, and I am glad that we are able to continue the most important work, the most important task – the essential task of liberation and the end of exploitation of man by man. Thank you. After the speeches were concluded, the delegates to the Third Congress of the American Party of Labor vowed their continued dedication to the struggles and victories to come.